The 2017 Mobility Assessment Report (MAR) was presented to the board on January 9, 2017. A copy of the presentation slides can be found here. 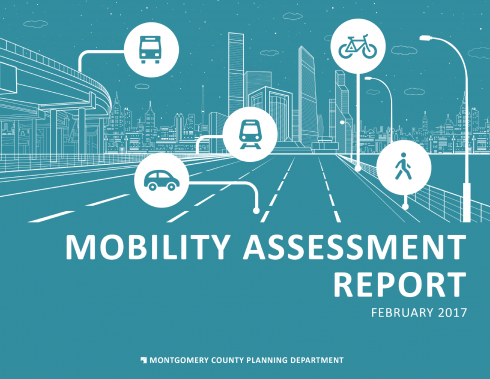 The MAR is a biannual monitoring report that summarizes transportation datasets to track and measure various mobility metrics in Montgomery County. The goal of the report is to inform residents and public officials of how the transportation system is changing, evolving, and performing within the county. This information provided in this report is also intended for use by the Planning Board and County Council to inform their commentary on this year’s State Consolidated Transportation Program (CTP) and the County’s Capital Improvement Program (CIP) project priorities. The 2017 MAR continues the progression and evolution of past reports (formally known as the Annual Development Approval and Congestion (ADAC) and Report and the Highway Mobility Report (HMR)) by incorporating new alternative transportation datasets and analytics beyond those that focus on the private automobile. The latest version of the report and appendix are now available for download.